When we think of Snow White, most of us remember the classic Walt Disney animated film, first released in 1937, and which has terrified small children ever since with its scary witch. However, the story of the film was not something that Disney dreamt up, it was based on a legend and, like similar tales, dates from centuries ago. The Disney version is very like the one which was noted down by the Brothers Grimm in 1857, and is one of the less bloodthirsty versions. One of the earliest written versions stems from 1634, long before the Brothers Grimm discovered it. Not intended for little ones, this tale was gradually enlarged, adapted and added to until it contained such intrigues as an illegitimate baby, cannibalism, witchcraft, lots of blood, murder, poisoning and sexual awakening. Perhaps it is not surprising that when Disney was searching for a suitable subject for his first full-length film, he decided to choose the diluted Grimm version, which he prettied-up and made even more harmless. Even so, it still contains poisoned gifts, attempted murder, witchcraft and the rather dubious concept of a young woman living with seven unmarried men! The Grimm Brothers begin their version with the description of a queen sewing as she watched the snowflakes falling. Not looking at what she was doing, she pricked her finger and a drop of scarlet blood fell. She thought that the red looked pretty on the snow, surrounded by the ebony of the window-frame, and she wished that one day she would have a child with snow-white skin, ebony hair and blood-red lips. In time, the queen did have such a baby, but then died, and the king took a new wife, who became the wicked stepmother. That’s when Snow White’s troubles began; the new queen was jealous and wanted the girl killed, and the story was skilfully and entertainingly brought to life by Walt Disney. When the film was issued, it was a huge success. It was Disney’s first feature film, and the music and colourful cartoons enchanted both children and adults. Many companies, such as Chad Valley, were quick to capitalise on the idea of media memorabilia. The Chad Valley sets were issued in the 1930s, and Snow White stood 16 inches tall, while the Dwarfs were around 6 inches. These calico-bodied dolls had moulded felt faces with painted features, and were very well modelled. Show White wore a pink and blue rayon dress with pink shoes and white underwear, while the Dwarfs had colourful felt outfits. Hair and beards were mohair, and they bore a reasonable facial resemblance to the cartoon versions. If you are very lucky, you might come across a doll with the original card swing tag, but in any case, the dolls should bear embroidered Chad Valley labels on their bodies. Today, a cloth Chad Valley Snow White, together with her Seven Dwarfs, in excellent condition, will cost you in the region of £1000. For most collectors, however, a Chad Valley set is beyond their reach; nevertheless many, more modern but still enchanting, dolls representing the ebony-haired girl and the droll dwarfs are available at just a fraction of that price. A grouping of them makes a particularly colourful collection. Snow White is one of those characters which everyone seems to recognise, and most people have a soft spot for her. The dwarfs are comical in appearance, so a Snow White display is cheerful and bright. Mattel have produced several versions of Snow White over the years, including a very pretty model dressed in her famous blue and yellow gown, which reveals her in a tattered dress, all ready to scrub the doorstep, when the skirt and sleeves are removed. Usually, these Mattel Disney dolls incorporate a Barbie body, but have a specially modelled head to represent the character concerned. For many years the company produced dolls to accompany the various films, but nowadays the dolls are often made by Vivid Imaginations or Simba. 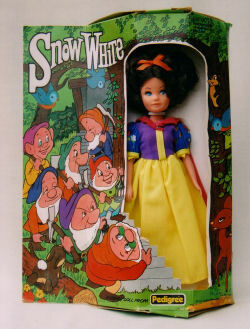 In the 1990s, Mattel issued a miniature Snow White, just seven inches high, in their ‘Dancing Princesses’ series. Finely dressed in her traditional yellow and blue clothing, she was mounted on a musical box. Small wheels under the music box enabled her to spin when the box was pushed along. Another Mattel series was the ‘Holiday Princess’ festive set, featuring Disney heroines. Amongst them was a pretty Snow White dressed in a blue bodice and white satin skirt, while the ‘Petite Holiday Princess’ collection contained miniatures of the dolls, with bells sewn into their skirts and a loop to hang them from a Christmas tree. Sets of Dwarfs were also made by the company, including an ingenious Dopey and Sneezy re-enacting a scene from the film when Dopey hid under Sneezy’s long coat. This clever toy had Dopey standing on Sneezy’s shoulders, and wearing an over-size coat which covered Sneezy, making Dopey appear twice as tall. 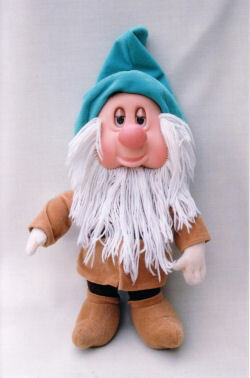 Some of the Mattel dwarfs had colour-change functions; they held a magic ‘jewel’ or other item which changed colour with the application of cold water. The clothes were moulded on to their bodies. Dwarfs seem very popular; a super Sleepy made by Mattel in the 1980s snores as his eyes close. More recently, Vivid Imagination’s sets have include one which depicts them all in their nightshirts! Squidgy all-in-one moulded vinyl sets can also often be found. These date from the 1970s and were probably originally intended as baby toys, but they all add interest to a Disney doll collection. 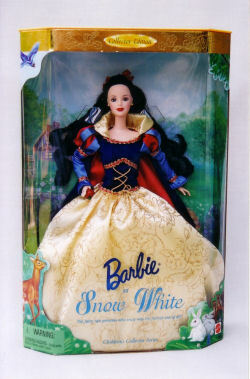 Barbie herself has depicted Snow White several times, as opposed to the character-headed version. A particularly attractive model is the Special Edition Snow White Barbie, from 1999, which depicts her in the classic yellow and blue gown. Barbie has exchanged her blonde hair and pink lips for black hair and bright face paint, and the overall effect is stunning. 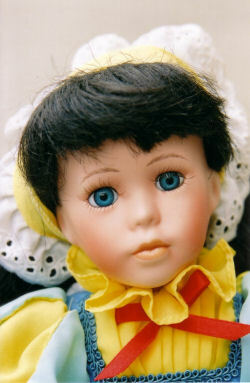 A doll very similar to Sindy appeared as Snow White, issued by Pedigree in 1978, and it is sought after today by collectors. This doll is a special prize when boxed, as the packaging is decorated with stunning graphics from the film. Today, Disney stores and toy stores regularly bring out different versions of Snow White, including dolls portraying her dressed for ballet, as a child or a baby, and she is also included in various play sets. One recent set, made by Vivid Imaginations, shows her unusually dressed in pink, and comes with a fawn, squirrel, rabbit and several bluebirds. There is also a set which shows her riding a horse. 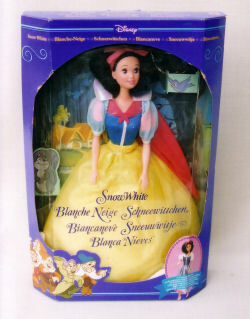 Many companies have produced porcelain Snow White dolls. Often, these are general depictions of the character from the legend, rather than from the Disney film. Edwin Knowles issued a delightful version in their ‘Heroines From the Fairy Tale Forests’ series. 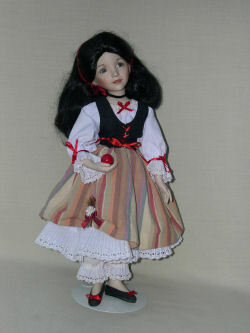 Designed by Dianne Effner, this Snow White has a pretty, innocent face and wears a red-striped beige skirt with a black bodice laced with red ribbons, and has ribbons decorating her white blouse. She stands 14 inches high. A smaller version, similarly dressed, was also made. A part-work entitled ‘Disney Princess’, published by De Agostini, which has a porcelain doll attached to each issue, has recently featured several different small porcelain dolls from the Snow White film. Amongst them was one wearing the yellow dress and another in a ‘ragged costume’ as well as dolls depicting the Prince and the Wicked Queen. Who can forget the Queen? She must have given millions of children the frights over the years! Disney issued an excellent replica of her in their‘Villains’ series, in the 1990s, and they still sell similar dolls today in their stores – though usually only around Hallow’een. The Wicked Queen is resplendent in a purple satin gown, red-lined black cloak, high white collar, gold crown and blood-red ruby at her throat, and is beautifully packaged, in a strong acetate-fronted display box. The Prince, too, has been depicted by companies such as Vivid Imaginations. One American writer claimed that the song, ‘Some day my Prince will come’ was responsible for the problems of a whole generation of American women, but to many, it became known as the ‘Kodak song’ (substitute the Prince for ‘prints’)! Of all the different versions of Snow White which have appeared over the years, the most accurate, very beautiful, representation of the white-skinned, ebony-haired, scarlet-lipped young girl – alo ng with her cheeky dwarfs – has to be the one by talented designer R John Wright Be warned, though, R John Wright’s work certainly does not come cheap – but it is exquisite. Moulded in felt, perfectly painted and shaded, his Snow White must be exactly how Disney first imagined his heroine. The dwarfs are also characterised just as they appear in the film. So, if you want to include a little fantasy in your doll collection, look out for Snow White and her seven dwarfs – I guarantee that every time you look at them, you won’t be able to resist a smile.